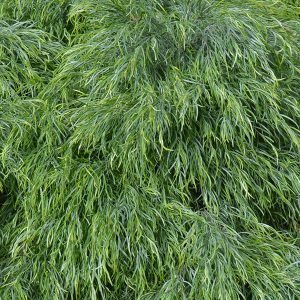 With its foliage that has a natural weeping habit and twisted undulating leaf margins, Acacia cognata fettuccine makes an excellent feature plant. It is low growing to around 1 metre in height, and over time it will spread to 1 metre across, sometimes more. 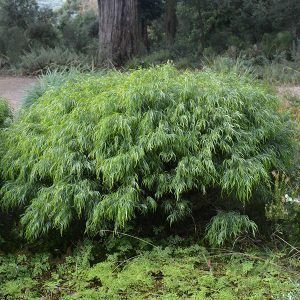 Being a low maintenance plant, and growing well in full sun to part shade it is used by landscapers for its year round foliage display. It will flower, although the small yellow flowers are rather insignificant. With its wonderful textured foliage, this is a versatile landscaping plant. New foliage has coppery tones and the green foliage with its twists and turns is attractive through the year. Suited to growing in the garden border or as a low edging plant, it will also grow well in containers. Acacia cognata fettuccine grows well in most climates although it does not cope well in humid areas. A well drained soil is best however clay soils or salt affected soils are not suitable. In reasonably good soils, fertiliser is not required. A native plant, low phosphate fertiliser can be used if required. Water over the first summer, after this it is a relatively drought tolerant. If you provide good drainage you should have no problems with this easy care plant.